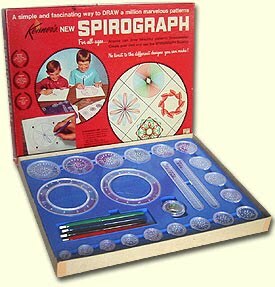 Man, I was terrible at Spirograph (still available today! ), but I loved it anyway. Raise your hand if you ripped the paper every time. Also, if you really want to see a Wikipedia entry that goes off the rails, check out the equations in the Spirograph entry. Somehow they do not help me improve my Spirograph skills one bit. Here's a fun blog entry where the writer remembers not just Spirograph, but plenty of other toys. She even remembers a variation I must have blocked out -- Spirofoil, saying "After I got bored with Spirograph, I moved on to Spirofoil. Just replaced the paper with thin sheets of aluminum that were incredibly sharp. The final result was colorful, though hardly the prettiest things in the world, but boy could they cut and shape wallpaper in a pinch." Anyway, this is the trippiest, most 1970s toy commercial around. SPIRO MANIA! Bob and Doug McKenzie's "12 Days of Christmas"
Gym, a.k.a. PE, Phy Ed, or even .... Phys Ed?